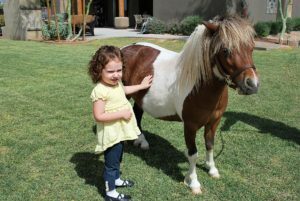 Pony 4 Precious was founded in 2016 by Mike Eastwood after working with a horse rescue organization that helped rescue a miniature pony, Winston. His previous owner said he had bad back legs and did not want him as he no longer held value to them. Our goal and mission is to everyday to try to educate children on Winston, miniature ponies and the horses. Our website offers videos, information, pictures, training, games, and kid friendly educational pieces that cater to all different types of kids throughout the world! This website will explain the equine life style and as someone who used to work in the city, I had the opportunity to meet with many families who felt Winston could bring a lot of joy and fun into their lives. Pony4Precious gives children a sense of ownership when being able to own an adoption share of a pony, as well as have access to online activities that will not only be fun for them but also be educational.